← How robust is Figure 10 in AR5-SPM ? UK temperatures since 1933 – Part 1. 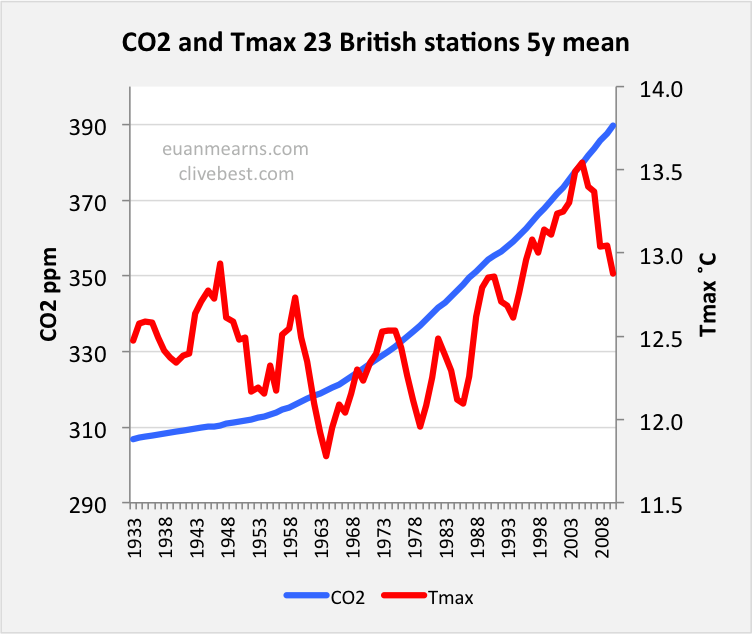 This is a repost written by Euan Mearns and is an introduction to the work we consequently did this summer concerning cloud and CO2 radiative effects on UK temperatures. Two more posts will follow describing the radiative model in more detail. Terrestrial sunshine records provide an inverse proxy for cloud cover. Sunshine at surface means cloud free line of sight between the point on the surface and the Sun. 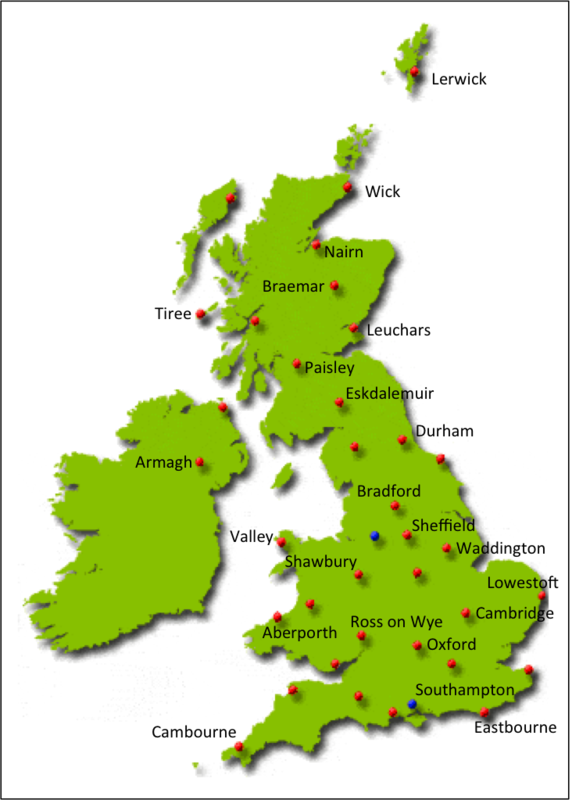 We present concordant sunshine and temperature records for 23 UK Met Office weather stations. 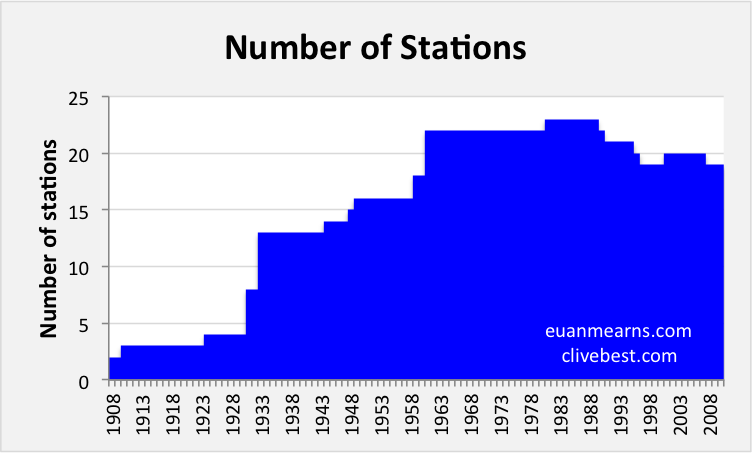 Data is available for a handful of stations from 1908 but it is only from 1933 that there are a sufficient number of stations to provide representative cover of the UK. Data from 1933 to 1956 is believed to be affected by air pollution from burning coal for home heat and power generation, therefore our main analysis focusses on the time interval 1956 to 2012. 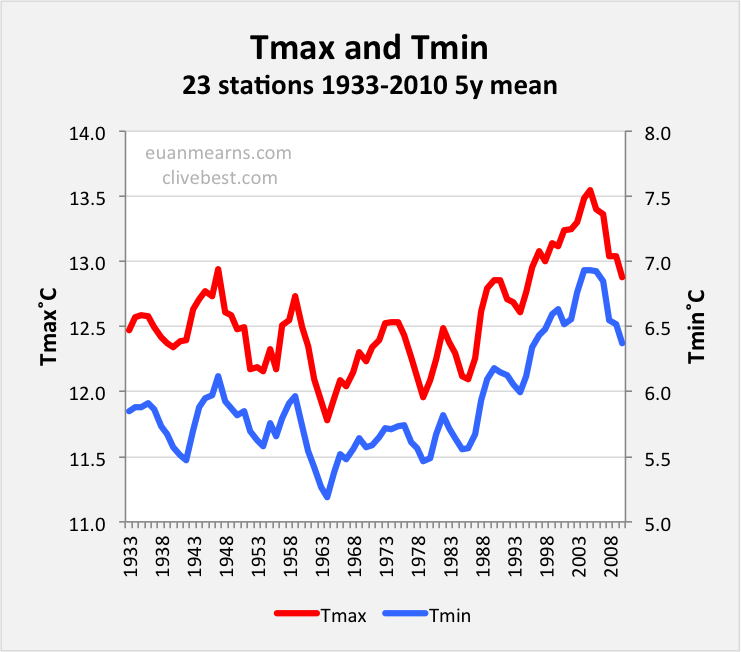 Both temperature (Tmax) and sunshine hours show cyclic variation, both showing a tendency to rise in the period 1980 to 2000 in keeping with global warming that has been documented in many studies. 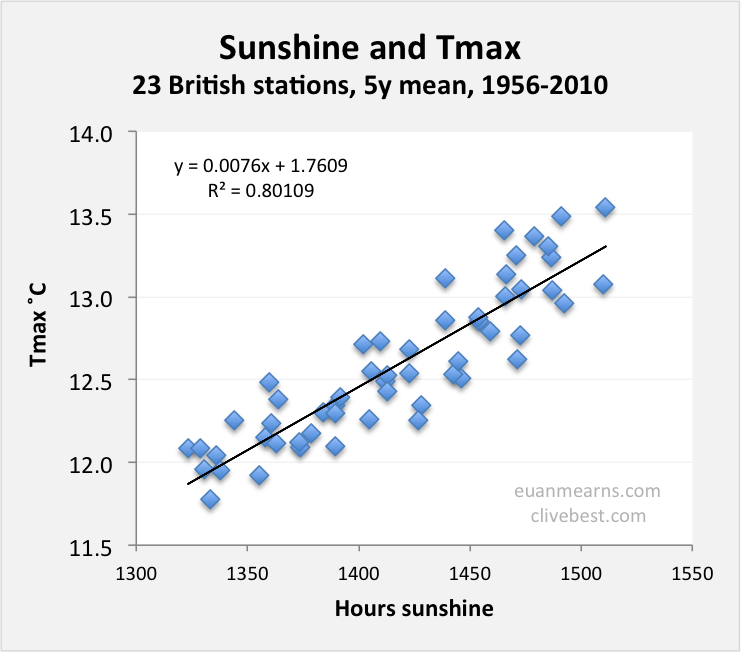 In the UK there is a high degree of covariance between sunshine and Tmax, sunny years tend to be warmer. 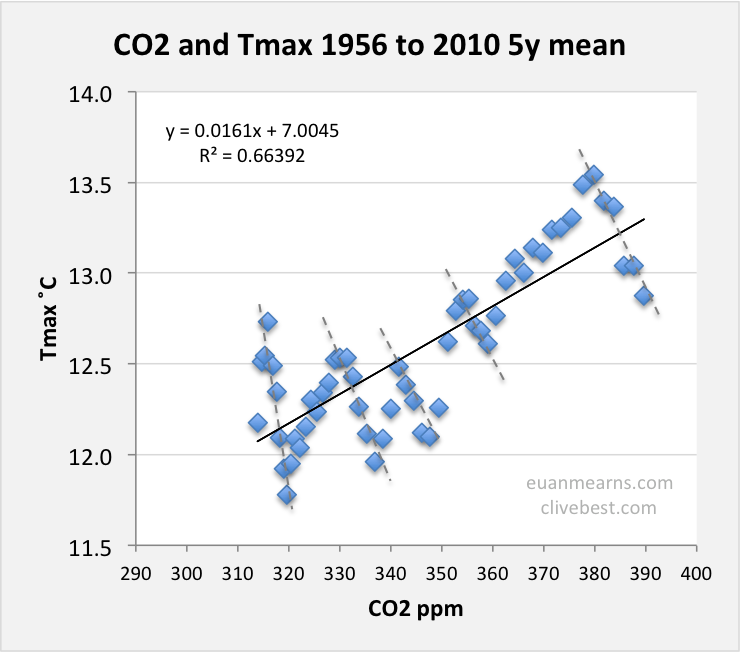 The correlation coefficient (R2) between sunshine hours and Tmax is 0.8 whilst R2 for CO2 and Tmax is 0.66 (calculated on 5 year means). A significant portion of warming observed in the UK may be attributed to temporal variations in sunshine and cloud cover. This post presents a summary of the raw data in 14 charts. Next week we will present a combined net cloud forcing and radiative forcing model with the aim of quantifying the relative contributions of dCloud and dCO2. Figure 1 Maximum daily temperature (Tmax, red, LH scale) and minimum daily temperature (Tmin, blue, RH scale) from the Leuchars weather station. The red and blue lines are annual averages. The black lines are centred 5y moving averages. Note high degree of co-variation between Tmax and Tmin. Also note how temperatures drifted higher during the 1990s and 2000s but recently are drifting down again, in keeping with the global temperature trend. 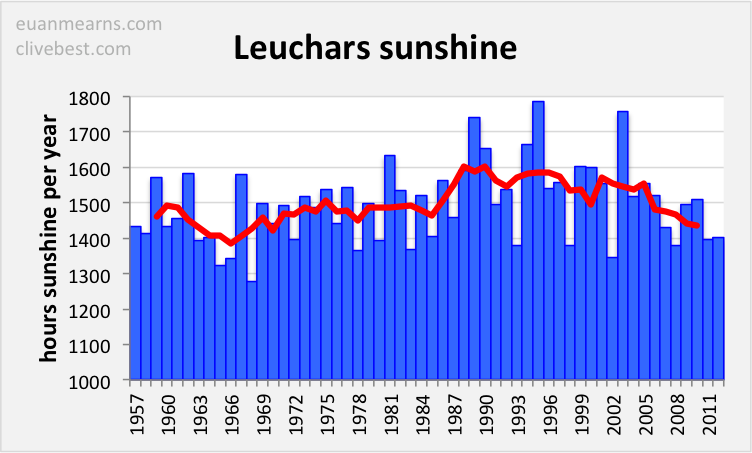 Figure 2 Average annual hours of sunshine at Leuchars (blue columns) with a 5y centred moving average in red. Note how the 1990s and early 2000s were clearly sunnier than the preceding decades and how more recently the amount of sunshine seems once again to be in decline and this broadly mirrors the temperature evolution (Figure 1). For more times than I care to recall I have sat down to write a book on energy and climate change. On each occasion my endeavour foundered early on through being distracted by detail. And so it was earlier this year. I had written down my lifelong recollections of climate change in Scotland – cold snowy winters in the 1970s, getting sunburned working in the fruit fields of Perthshire in the 1980s, frost free winters in the 2000s, cold snowy winters today – and I wanted to check my recollections against data – a fatal mistake. I stumbled upon the UK Met Office climate station database, a wonderful resource, and downloaded data from Leuchars, Braemar and Nairn, the three stations closest to where I grew up in Kirriemuir and where I now live in Aberdeen. 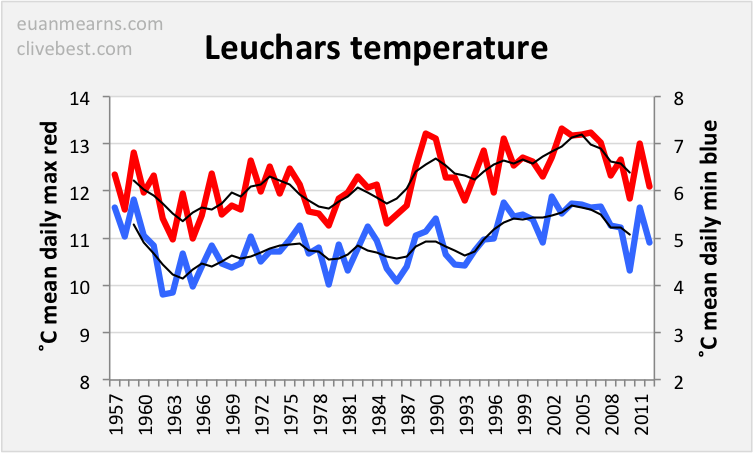 Some of this “raw data” from Leuchars is shown in Figures 1 and 2 and from looking at a few charts like these I observed cyclical changes in temperature with time that seemed to be matched by cyclical changes in the amount of sunshine. Warm years were sunnier than colder years. This led me to compile data from 23 UK stations (Figure 3) from which a clear picture of co-variance between sunshine and temperature emerged. I wanted to be able to quantify the relationship between sunshine and temperature and contacted physicist Dr Clive Best who seemed pre-eminantly qualified to help. This has led to a 3 month collaboration and writing two papers, one on UK and the other on Global variations in cloud cover and its impact on temperature trends. The UK paper was rejected twice by Nature and by one other journal and so we have decided to hang the establishment and publish this work on our blogs. The Global paper is still out for review. This is the first of three posts on UK climate records starting with a simple description of the database. If there are any editors or academics out there who want to see this published in peer reviewed literature then please get in touch (read the Blog Rules). All Met Office stations record maximum daily temperature (Tmax) and minimum daily temperature (Tmin), rainfall and the number of frost free days. A subset of stations also record sunshine hours and it was stations with lengthy sunshine records that formed the basis for station selection. The data are reported as monthly means. The records are not 100% complete (I’d estimate >99% complete) and where data is missing it has been patched with data from the preceding year. If there was no preceding year, the succeeding year was used. The selected sites are shown in Figure 3 and the distribution of records in Figure 4. Figure 3 Met Office climate stations used in this study. Figure 4 The time distribution of records. 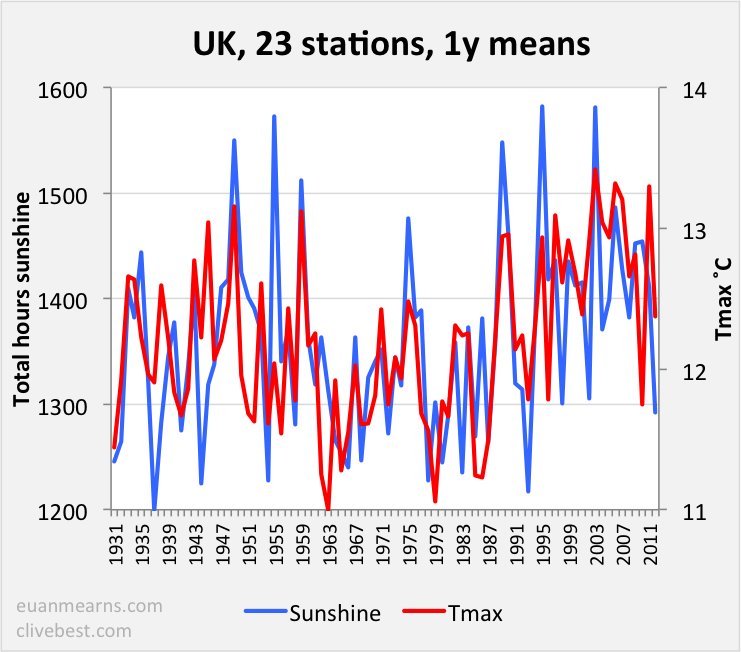 A handful of Met Office stations have sunshine records from 1908 but this small number fails to provide statistically representative cover of the UK. It is only from 1933 that a large enough number of stations were reporting both sunshine and temperature records to provide representative geographic cover. Hence all data presentations and analysis are based on the 1933 to 2010 time interval. Since we use 5y centred means in our analysis, data from 1931 to 2012 is captured. Over this period the number of operating stations varies, with a peak in the 1980s. There is a large variation in temperatures from N to S produced by 10? of latitude separation. Lerwick is, on average, about 5?C colder than Southampton (Figure 5). There is also a large N-S range in sunshine received. Note that over a year, every point on the globe should receive the same hours sunshine with a spherical horizon. That is (365.25*24)/2 = 4383 hours per year. The variance in hours sunshine therefore reflects N-S trends in cloud cover. Southampton receives about 600 more hours sunshine each year than Lerwick. Eastbourne is anomalously sunny (Figure 6). There is a high degree of cyclic co-variance in Tmax across the country. Note how spikes and troughs in Lerwick match spikes and troughs in Southampton (Figure 5). The N-S variance in sunshine / cloud cover is more chaotic, and lacks the strong co-variation seen in the Tmax data (Figure 6). 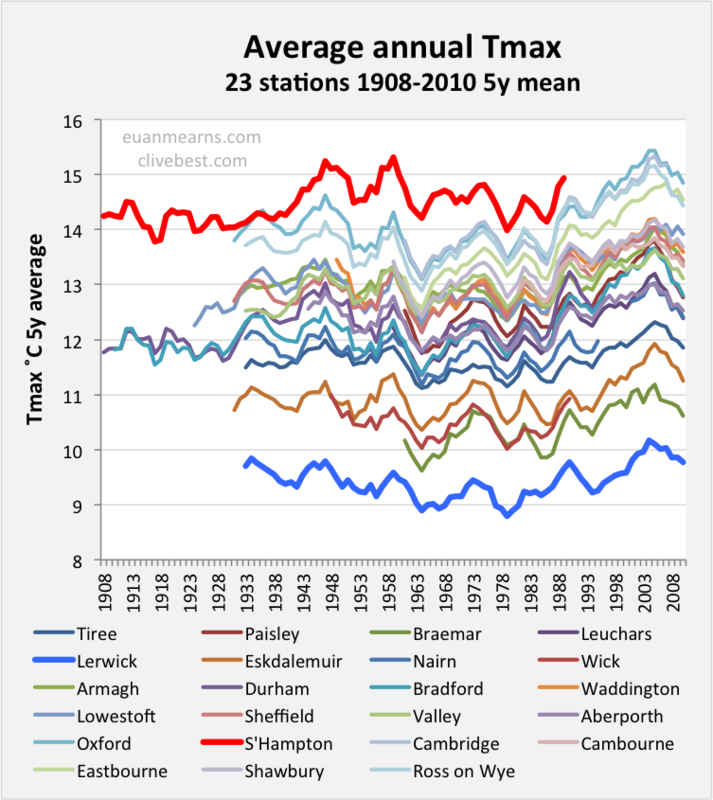 Figure 5 Tmax, 5y running averages for 23 UK stations. 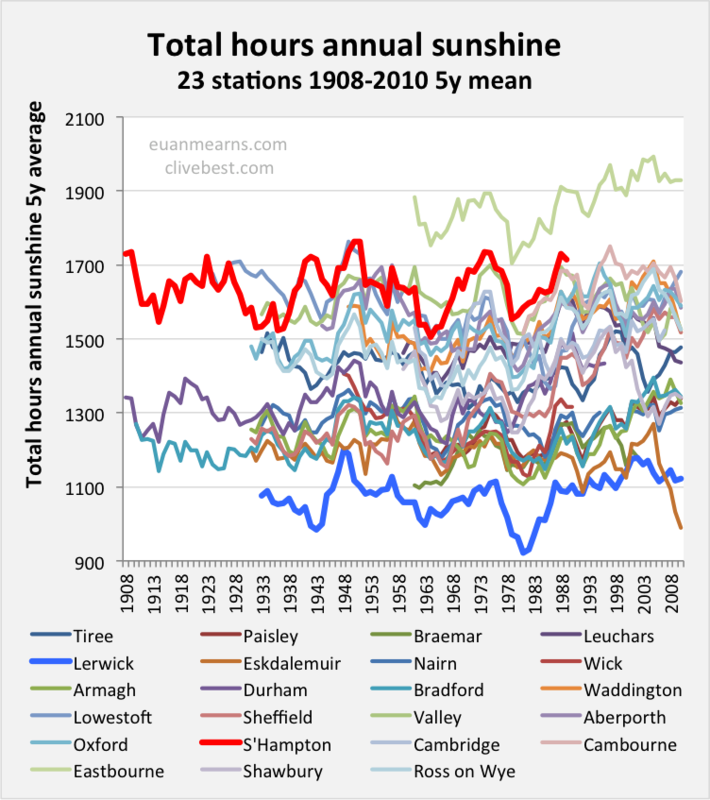 Figure 6 Sunshine, 5y running averages for 23 UK stations. 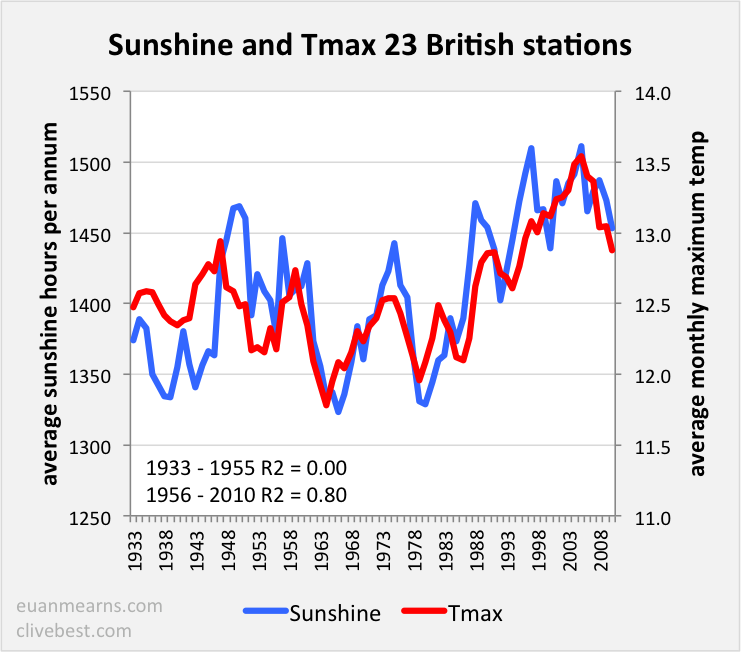 Averaging the data for all 23 stations shows a degree of co-variance between temperature and sunshine although there are instances of negative correlations where spikes down in Tmax are matched by spikes up in sunshine (Figure 7). This may reflect annual variations in sunshine distribution, for example, some years may have sunny summers while others have sunny winters. It is also evident that temperatures where higher in the 1930s and 1940s, lower in the 1950s to 1980s and higher again in the 1990s and 2000s and this decadadal structure in Tmax is also reflected in sunshine / cloud cover. If this is not obvious, then further smoothing of the data using a 5y mean shows clearly that cyclic change in Tmax is mirrored by cyclic change in sunshine hours (Figure 8). Figure 8 The data shown in Figure 7 smoothed further by applying a 5 year running average. The degree of correlation between sunshine and temperature is quite striking though imperfect. At the beginning of the time series it is evidently lacking altogether and this is surprising since co-variance in sunshine and temperature is intuitively expected. To explain this we call on the introduction of clean air legislation in the UK in 1956. 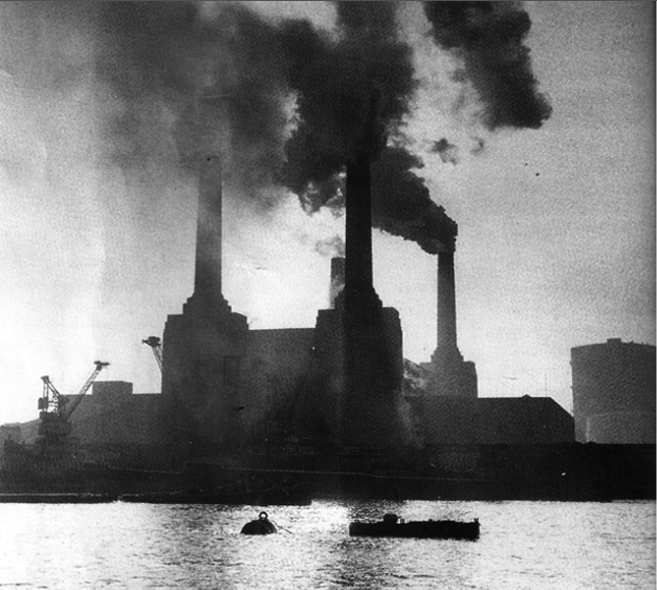 Prior to this date, coal was burned in open hearths throughout UK cities and power stations were also located in cities, for example the iconic Battersea Power Station in central London (inset photograph). Burning all this coal produced dense and lethal smogs, and we suggest that this pre-1956 pollution has perturbed the expected correlation between sunshine and temperature. Looking at seasonal data we see that the link between temperature and sunshine holds good for the summer months, pre-1956, when burning coal was at a minimum. This will be the subject of the third post in this series. The radiative and CO2 forcing models that we will present next week will consider only Tmax. That is because when considering the impact of sunshine and cloud cover on the temperature record it is daily Tmax that is most relevant. 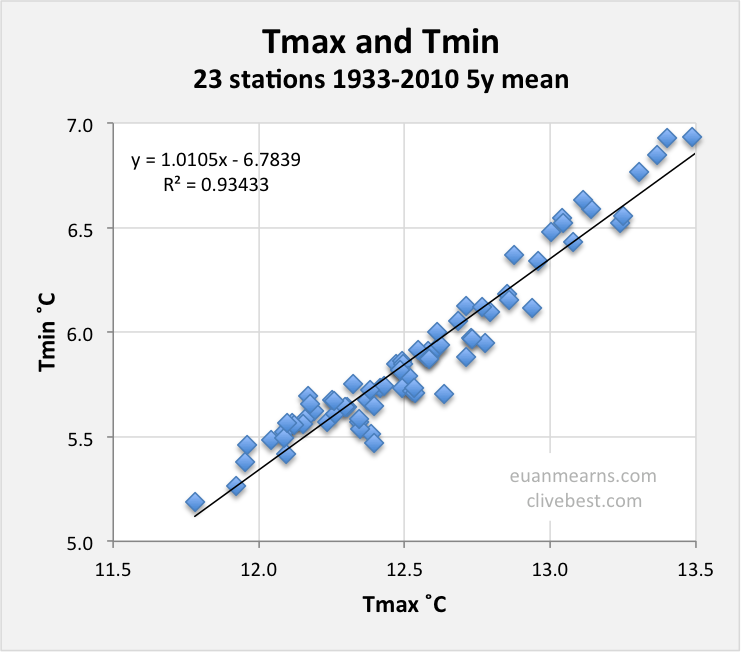 However, it transpires that there is a very high degree of co-variance between Tmax and Tmin (Figures 9 and 10), hence, conclusions drawn for Tmax may equally apply to Tmin and daily average temperatures. Figure 10 Cross plot of data shown in Figure 9 showing an exceptional degree of correlation between Tmax and Tmin. By and large night time temperatures have a memory of the day before. Figure 11 shows the difference between Tmax and Tmin over time. 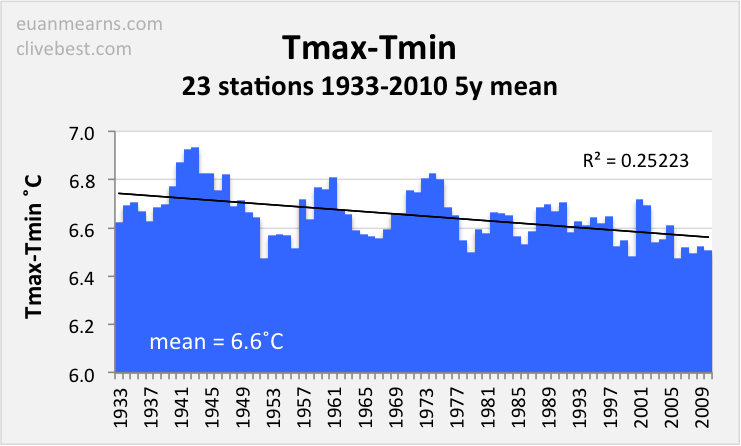 The trend is perceptibly down by about 0.2?C over a 70 year period and it seems possible this may be due to increased radiative heating at night. Figure 12 Comparison of Tmax varaiance in the UK with CO2 smoothed from Moana Loa data. Figure 12 shows the correlation between CO2 and Tmax (compare with Figure 8) and highlights a key problem with all models that seek to explain troposphere warming by CO2 alone ± other natural forcing such as volcanoes and variance in solar insolation. CO2 is periodically discordant with cooling trends, e.g 1933 to 1963 and with cyclic ups and downs in the temperature record. In contrast, cyclical change in sunshine / cloud cover can explain the cyclical variance in Tmax (Figure 8). Figure 13 Overall, CO2 and Tmax shows reasonable correlation. But there are 5 periods of marked negative correlation where temperature is falling as CO2 is rising. There is a correlation between Tmax and CO2 with R2=0.66 (Figure 13). But the correlation between Tmax and sunshine is stronger with R2=0.80 (Figure 14). This is as far as I (EM) was able to take the empirical analysis but recognised that a physicist should be able to calculate from these data the component of Tmax variation attributable to sunshine and cloud cover and that attributable (if any) to CO2. At this point Dr Clive Best offered his assistance that led on to 3 months of fruitful collaboration. In a post next week we will present the results of combined net cloud forcing and radiative forcing models. The analysis does show that a significant portion of warming in the UK may be attributable to a decline in cloud cover and any global climate model that does not take variance in natural cloud forcing into account will overestimate the role of CO2. This entry was posted in AGW, Climate Change, climate science, UK Met Office and tagged Climate Change, Clouds, CO2. Bookmark the permalink. 9 Responses to UK temperatures since 1933 – Part 1. Many thanks for the update, and kudos for all the hard work. 1) Where is the water vapour (WV)? There does not appear to be any accounting for WV. As WV is the undisputed most important GHG, one would imaging that accounting for it should be the first priority. This may also be particularly telling for Fig 13, which almost surely displays multi-dimensional dynamics. I can send you a picture if you like, but imagine, say, a helix in 3-space, but where only its shadow is seen on the wall. For example, imagine if, say, WV, is the dimension “going into the page”. How would that help to explain the dynamics? All those short lived intermittent -ve trends do rather feel like other dimensions/factors. If not, then the stochastic/variance features will pose deeper problems for “explanations”, and linear regression on data with these characteristics is not meaningful. … just because a spreadsheet or whatever “can” perform a curve fit, that does not mean the results are useful. a) Linear regression is highly suspect in such analysis for many reasons well beyond the current scope. However, one fairly standard “rule of thumb” is R2’s below the “high 90’s” imply more or less a meaningless fit. Fig 11 is a good example of the “jeopardy”. A 0.2’ish R2 is completely meaningless. A tiny change in the data could easily reverse the slope of the fit, and that would play havoc with any “theories” depending on slope (as presented in the post). Indeed, just corrections to the data, or choosing a different methods for averaging across the inputs could produce such “reversals”. … or someone could wilfully manipulate such “results”, e.g. do the regression for1950 – 2000 instead, just for fun … what is the slope? That is, longer or shorter sample sets, and “careful” selection of start/end points could be used by others to arrive at an “opposite” conclusion … they would be wrong too! The data is just too variable for these types of interpretations (at least not without more info). Moreover, just the variance in Fig 11 is about equal to or greater compared to the planet’s entire average warming over the past century … as such, reliance on the Fig 11 regression is very dangerous. a) It appears to be the Keeling curves mean, which is an average of an already heavily “fitted” data set, and not anything near what the raw data looks like. This too is open to statistical manipulation. This is a common problem in the blogosphere. b) Mona Loa is rather far away. On short time scales it may well be more impacted by whatever the jet stream carries over from China, etc and so any attempt to correlate that to highly localised temps 10,000 miles away on such short time scales is somewhat questionable. In any case, there is no question that more data is a good thing, and again kudos for the work … would be very interested in the results above being expanded to incorporate other dimensions (e.g. WV etc) for what is certainly a multi-dimensional problem. 1. Regarding water vapor: Yes – it is by far the most dominant greenhouse gas but levels can vary on a daily basis especially in the UK. What matters more for the greenhouse effect are levels in the upper atmosphere and there is some evidence these have fallen thereby compensating CO2. So yes this analysis assumes a constant average relative humidity over the UK over a 80 year period. I also agree that projecting onto a single variable – like CO2 or clouds is over-simplistic, but what else can we do to identify empirically what the underlying drivers of climate really are ? 2. The type of statistical analysis you have used is highly inappropriate Probably this is a result of using excel. However just about everyone uses linear regression including the IPCC to produce various “trends” such as “warming per decade”. Always this implies a simple one dimensional dependence which as you say might be naive. 3. Mauna Loa data: What you say is of cause true. Everyone again assumes the “well mixed greenhouse gases” assumption. I doubt very much whether GCM models allow for local emissions over China today or over the UK in the 1930s. There were probably far higher levels of CO2 locally in industrial cities than measured in Hawaii today. So really this study looks at only 2 aspects of climate as measured in one small island – UK. a) annually averaged net CO2 levels and b) average cloud cover. Clouds simultaneously cool the planet through increased albedo while warming the planet at night through an enhanced GHE. CERES has measured that the net effect globally of clouds is cooling of -21 W/m2. The UK is dominated by low clouds from Atlantic weather systems so this cooling effect is likely much higher – as every child knows on a beach in summer. Please wait also for the next 2 posts about the UK and the global results later on. your 3rd assumption re Maouna Loa would seem to rule out a lot of the IPCC science – so perhaps we should leave the position moot for non=-IPCC science? Dr Oli, thanks for your comment but I think some of your criticism is premature since we have not yet presented our interpretation and physical models – and I see Clive has already addressed the main points. Regarding water vapour, our net cloud forcing model aggregates the cooling (reflection) and warming (radiative heating) aspects of clouds and in my mind this incorporates temporal variance in water vapour. I don’t understand your comment about Figure 11 that simply shows the difference between Tmax and Tmin over time. This is a simple empirical observation and we don’t use it for anything. CO2 at ground level in the UK may well be higher and more variable than Moana Loa but we don’t have that data so I think using the Moana Loa data is fair enough as a first pass. This “error” I believe will lead to us over-estimating the impact of CO2. Can you explain on what grounds they rejected it? Isn’t it just as likely that you are looking at the affect of UHI and heat soak? You can see from figure 12 why the Climate Scientists jumped on the CO2 band wagon for the period between the 60s and 2003 and why the various agencies want to lower the past before the 60s to fit the narrative. In this case, we have no doubt that your analysis of the relationship between sunshine hours, cloud cover and temperature variance in the UK will be of interest to fellow specialists. However, we are not persuaded that your findings represent a sufficiently outstanding advance in our general conceptual understanding of climate change and its causes to justify publication in Nature Climate Change. Of course we are also outsiders which doesn’t help our case. Yes the difference between Tmax and Tmin is interesting. It has once been claimed that global warming occurs mainly at night as minimum temperatures seem to be rising. But as you say there may also be an UHI effect at work since 1950 in UK cities. 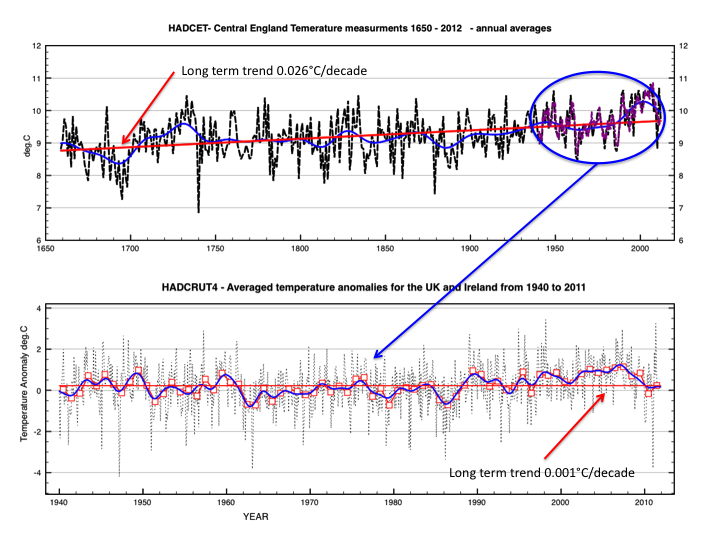 The long term trend in UK temperatures also shows a n increase before the industrial revolution. The CET series from 1650 is interesting. It also demosntrates how relatively small any net AGW effect really has been in the UK. The over-reaction on energy policy is certainly not justified in the UK where even a 2C increase would not be a cause for concern. Hello AC, “Isn’t it just as likely that you are looking at the affect of UHI and heat soak?” – yes. I originally said UHI but upon recognising that many / most of these sites are rural backed away from that. The overall effect is tiny (0.2?C)and suffice to say that it could be due to natural variability or to an aggregation of several human causes (for example increased humidity due to human activity such as irrigation and burning lots of stuff) or both. Many thanks for the good work, one tiny detail for a weather station name – Cambourne is a new town in Cambridgeshire – the Cornish one is Camborne. You guys may be interested in a Forum where someone has already explored this topic for Australia.